have up to 7 live lambs at one time, and rise half of them on her own milk. 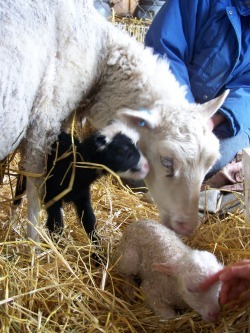 Litters of 6 are not uncommon, but single lambs are, atleast here on our farm! We are experimenting with Finn crosses right now, and are working with some Texel and Rambouilette bloodlines to make a bigger meatier sheep and keep the exceptional mothering abilities of the Finns that we love so much. As handspinners, Finn sheep are lots of fun. They are fine wooled and come in a wide variety of natural colors, including grey, browns, blacks, piebalds, and even a chocolate and blue can be found in Finn fleeces as well as many shades of white. Please contact us for sheep availability. Ewes range from $150 for ewe lambs and up to $250 adult ewes. Sheep 101 - breed info, sheep raising, and showing.